Like the roti to India or burger bun to America, the croissant is France’s most emblematic carb. What you may not know however, is that it comes under the category of viennoiserie— “Things of Vienna”. Sorry to break it to you Francophiles, but yes, the beloved croissant is not in fact a French pureblood but rather a love child between France and Austria. The origin of the croissant is the Austrian kipfel, a baked good made with a denser dough. One legend has it that after the Ottoman siege of Vienna in 1683, Viennese bakers created the kipfel in the same crescent shape as the moon on their Turkish enemy’s flag, while another claims that Marie Antoinette, the ultimate celebutante influencer of her day, was responsible for introducing her native fave to France. The truth is, it was Austrian entrepreneur August Zang who opened the first Viennese bakery in Paris in 1838, and somewhere along the line the French started making kipfel with puffed pastry dough, an invention that is undoubtedly theirs. Now that we’re done with the history lesson, let’s talk about the croissant in all its current glory! While they can be made with margarine, at OMBC Chennai and Hyderabad we opt for butter only, resulting in rich taste and flaky finish. You may think you’re most likely to taste an authentic croissant in France itself, but the sad truth is that almost half of the croissants there are industrially produced, i.e. made from frozen dough. So cancel your visa appointment, set aside your book of French phrases, and instead come to your local OMBC for your Parisian fix! Heard about our subscription service? 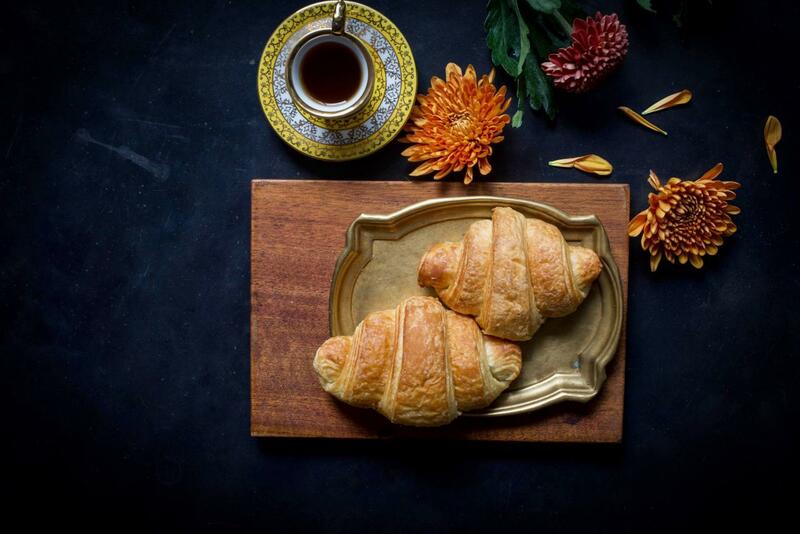 A Parisian breakfast of 2 croissants is one of the options for fresh-baked, all-natural, preservative-free goods you can have delivered to your home. The beauty of croissants is they can be used as a base for sweet or savoury flavours. Slather them with jam or Nutella, or slice and fill with our imported cold cuts and cheeses for a satisfying breakfast sandwich. You can even use day-old croissants as a base for baked French toast or breakfast casseroles! Here is a recipe that works great with slightly stale croissants—it’s so good you’ll be tempted to let them sit for a day or two just so you can make this! Recipe notes: frozen blueberries are now available in Chennai and Hyderabad specialty stores and cream cheese can be found in the cold section of OMBC.